I am sure many of you have must be dreamt of using wooden tiles for your home. But due to a myth of high maintenance or scratches or might not be compatible with your home design you wiped out that thought Right? Let me give some insights on benefits of using wood effect tiles for your home and you will surely get convinced to consider wood effect tiles. There are several options for Ceramic wall tiles, but ceramic wood tiles have a different appearance in visualization copying the effect of hardwood. It has gained more attention from the audience due to innovation in technology making them more realistic in nature. Use of Wood tiles is not limited to the bedroom; you can choose for your entire home. Whether kitchen, bathroom or living area. Moreover, it is also applicable on walls for a creative and complementary look. 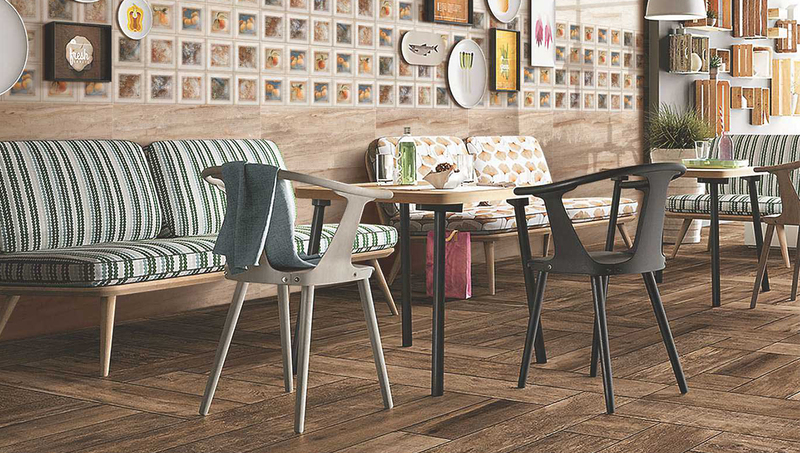 Let's have a quick glance at merits of using wood effect tiles. 1) Durable: We all know that ceramic tiles are considered to be good for durability. Ceramic wood tiles are recommended because they are durable and also offers various trendy patterns and designs. You may find stains, scratches or minor damages, but it can be avoided if they are installed properly. Even in the damp areas like bathroom or kitchen- which has more footfalls, ceramic wood tiles have a lifespan of more than 30 years before they need any replacement. 2) Easy to Maintain: There are various tiles that require a high maintenance, unlike to them wood tiles do not require personal attention and care - special cleaning products. It is easy to maintain by using only water and does not damage tiles by using acidic products. It also requires less effort to mop regularly making them look shiny and new. 3) Heat resistant: Ceramic wood tiles are heat resistant and non-combustible. The upper layer of the tiles is not affected due to flames or the surface do not get darker due to contact with hot things. Completely safer to use these tiles in any living spaces. 4) Customized Tile Options: Ceramic wood tiles are available in a variety of designs and patterns, but clients can also have options to choose their own style of textures or color scheme for their tiles. We provide various tile options to choose in terms of color, texture or finish to our valuable clients. 5) Install Anywhere: Usage of wood tile is not limited to floors, you can even utilize them for the walls of kitchen and bathroom to give a trendy and designer look to your room. They can even be used for outer areas as they are weather-proof and resistant to damage from natural elements. 6) Hygienic: Ceramic wood tiles are hygienic as they are easy to clean and maintain as a result in no bacteria formation. Rot-proof and non-absorbent tiles, you can even use in public places and commercial areas. 7) Affordable: Wood effect tiles are much cheaper and of good quality than hardwood flooring. You actually get satisfaction for what you have paid by considering wood effect tiles. What more do you need? If you are getting such durable, low maintenance and resilient tiles at such an affordable price. Conclusion: No matter which design tile matches your entire decor, wood effect tile is the best alternative to hardwood flooring and capable enough to fulfill your dreams. If you would like to check out more about tiles; consider Q-BO ceramics - one of the leading among Ceramic tiles company in India. Just explore our extensive range of ceramic wall tiles and digital wall tiles, by dropping us a message at info@q-bo.in.